For the rose species, see Rosa × alba. For other uses, see White Rose (disambiguation). The White Rose of York (also called the Rose alba or rose argent), a white heraldic rose, is the symbol of the House of York and has since been adopted as a symbol of Yorkshire as a whole. The origins of the emblem are said to go back to the fourteenth century, to Edmund of Langley, the first Duke of York and the founder of the House of York as a cadet branch of the then ruling House of Plantagenet (although other reports suggest the rose and Yorkshire have links going back further than that.) The actual symbolism behind the rose has religious connotations as it represents the Virgin Mary, who is often called the Mystical Rose of Heaven. The Yorkist rose is white in colour, because in Christian liturgical symbolism, white is the symbol of light, typifying innocence and purity, joy and glory. During the civil wars of the fifteenth century, the White Rose was the symbol of Yorkist forces opposed to the rival House of Lancaster. The red rose of Lancaster would be a later invention used to represent the House of Lancaster, but was not in use during the actual conflict. The opposition of the two roses gave the wars their name: the Wars of the Roses (coined in the 19th century.) The conflict was ended by King Henry VII of England, who symbolically united the White and Red Roses to create the Tudor Rose, symbol of the Tudor dynasty. In the late Seventeenth Century the Jacobites took up the White Rose of York as their emblem, celebrating "White Rose Day" on 10 June, the anniversary of the birth of James III and VIII in 1688. At the Battle of Minden in Prussia on 1 August 1759, Yorkshiremen of the King's Own Yorkshire Light Infantry's predecessor the 51st Regiment picked white roses from bushes near to the battlefields as a tribute to their fallen comrades who had died. They stuck the plucked white roses in their coats as a tribute. Yorkshire Day is held on this date each year. The Yorkist Rose was engraved on the coffin holding the remains of King Richard III, the last Yorkist king of England and the last to die leading his troops in battle, interred at Leicester Cathedral on 26 March 2015. The coffin was made by Michael Ibsen, a distant relative of the king, whose DNA helped to prove his identity. The flag of Yorkshire is a White Rose of York on a blue background. The flags of the three ridings also prominently include it. More than 20 civic entities in Yorkshire have a coat of arms that includes the rose of York. When depicted at small size it is rendered more simply, more as a graphic image. In heraldry The Rose of York is defined only in words Rose Argent barbed and seeded proper (a white Rose with sepals and seeds in their natural colours). According to the College of Heralds, the heraldic rose may be used with ether a petal at the top or with a sepal at the top. Traditionally, the rose is displayed with a petal at the top in the North Riding and West Riding but with a sepal at the top in the East Riding of Yorkshire, However this custom is often disregarded. 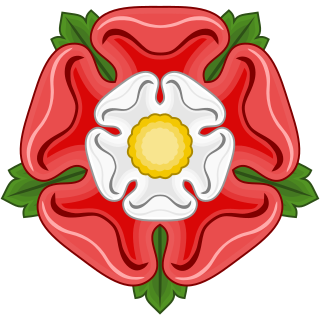 The Yorkist rose is used in the seal of the City of York, Pennsylvania, which is known as White Rose City. The town's minor league baseball team, which played in different leagues for several decades, was called the York White Roses. A 2016 York Revolution War of the Roses hat worn by Michael Rockett. 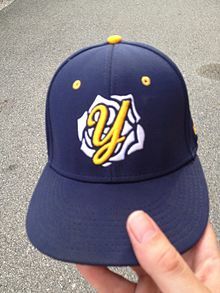 The white rose is also featured on one of the hats for York's current minor league baseball team, the York Revolution. The hats are worn during War of the Roses games vs. the Red Rose City, the Lancaster Barnstormers. The York Rose features on the shield of Canada's York University. The York Rose also features in the emblem of Lenana School, a tier-one High School in Nairobi, Kenya. Lenana School was formerly known as Duke of York School, after the Duke of York. Queens County, New York uses the white and red rose on the county flag. Queens County was named after Queen consort Catherine of Braganza, spouse of Charles II who sent a fleet to New York in 1664 to recapture New Amsterdam from the Dutch and renamed New York for the Duke of York, James brother of Charles II. White rose is also the coat of arms of Lithuanian town Alytus - the regional capital. It is also one of two coat of arms in the country that features roses. The largest pedestrian bridge built in 2013 - 2015 is also named "The bridge of White Rose". The name was chosen by the citizen of the town. ^ "The Edward IV Roll". Free Library of Philadelphia. Retrieved 21 March 2008. ^ a b c d e "The White Rose of Yorkshire". YorkshireHistory.com. Retrieved 21 March 2008. ^ Herbermann, Charles, ed. (1913). "Liturgical Colours" . Catholic Encyclopedia. New York: Robert Appleton Company. ^ "Newcastle's Mob". 5: 41–49. JSTOR 4048356. ^ "The Battle of Minden". HumanFlowerProject.com. 2006. Retrieved 21 March 2008. ^ "Yorkshire". Flag Registry. Flag Institute. 5 July 2008. Retrieved 28 October 2018. ^ "Yorkshire - East Riding". Flag Registry. Flag Institute. Retrieved 28 October 2018. ^ "Yorkshire - North Riding". Flag Registry. Flag Institute. Retrieved 28 October 2018. ^ "Yorkshire - West Riding". Flag Registry. Flag Institute. Retrieved 28 October 2018. ^ a b "Civic Heraldry UK: Yorkshire". Retrieved 3 August 2015. ^ a b "Flying the Flag". Yorkshire Ridings Society. Retrieved 17 July 2015. 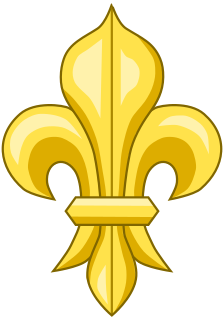 The fleur-de-lis or fleur-de-lys is a stylized lily that is used as a decorative design or motif. Many of the Catholic saints of France, particularly St. Joseph, are depicted with a lily. Since France is a historically Catholic nation, the fleur-de-lis became "at one and the same time, religious, political, dynastic, artistic, emblematic, and symbolic", especially in French heraldry. A saltire, also called Saint Andrew's Cross or the crux decussata, is a heraldic symbol in the form of a diagonal cross, like the shape of the letter X in Roman type. The word comes from the Middle French sautoir, Middle Latin saltatoria ("stirrup"). The Tudor rose is the traditional floral heraldic emblem of England and takes its name and origins from the House of Tudor, which united the House of York and House of Lancaster. The Tudor rose consists of five white inner petals, representing the House of York, and five red outer petals to represent the House of Lancaster and its superiority to the House of York. The eagle is used in heraldry as a charge, as a supporter, and as a crest. The symbolism of the heraldic eagle is connected with the Roman Empire on one hand, and with Saint John the Evangelist on the other. A number of cross symbols were developed for the purpose of the emerging system of heraldry, which appeared in western Europe in about 1200. This tradition is partly in the use of the Christian cross an emblem from the 11th century, and increasingly during the age of the Crusades. A large number of cross variants were developed in the classical tradition of heraldry during the late medieval and early modern periods. Heraldic crosses are inherited in modern iconographic traditions and are used in numerous national flags.